Enhance your space with charming seasonal decorations and fill your decor with holiday spirit! We are pleased to offer a number of options for adding red and green flair to your environment. Ornaments hung from the tree are a classic accent, while our other holly jolly decor includes items like Christmas statues and winter village sets for collectors. 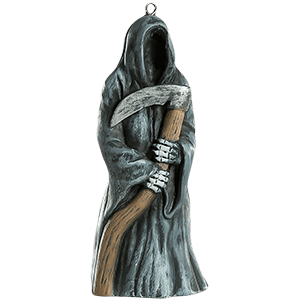 Our Christmas ornaments include a wide range of pieces that extend far outside of the typical options, such as steampunk, Lord of the Rings, Game of Thrones, zombie, and Celtic knot designs. 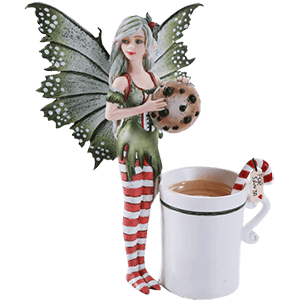 Our holiday statue offerings show similar variety with Santa-esque fairies, skulls, and witches to choose from. 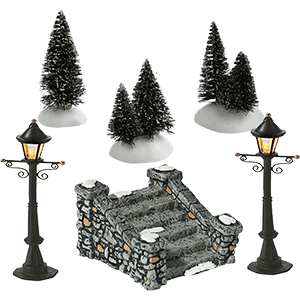 Our line of Department 56 village products is sure to impress with intricate porcelain buildings, characters, and other village accessories to illuminate and decorate your miniature town. 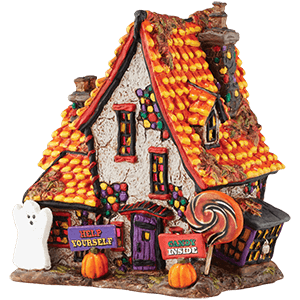 If Christmas is not your thing, these holiday villages even extend to the spookier side of home decor with fun Halloween village sets. Be sure to visit this category whenever you get in that holiday mood! Here you will find a wonderfully unique variety of Christmas ornaments. 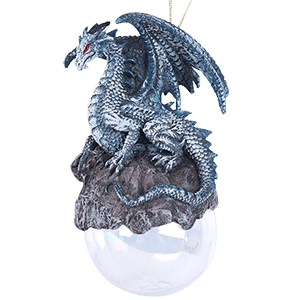 We have ornaments to suit any taste, from steampunk and fantasy themes to medieval and Celtic themes. Stop in and have a look! We make some of these ornaments right here in our own shop out of wood, leather, and other quality materials. Looking for something different, something that will stand out? You are in the right spot! 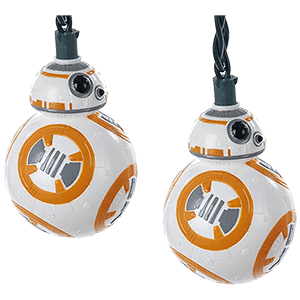 Shop below for some of the most unique Christmas ornaments available on the internet. Hearkening back to a simpler time, the New England Village collection by Department 56 recognizes the traditions and culture of early America with its delicately hand-painted porcelain buildings and village accessories. Whether you are creating a bustling seaport or a rural farm scene, the New England village buildings will make the perfect addition to your peaceful hamlet. A warm glow shining from their windows, the illuminated porcelain buildings include community structures like a schoolhouse, a library, a bank, a farm, and a maple syrup refinery. 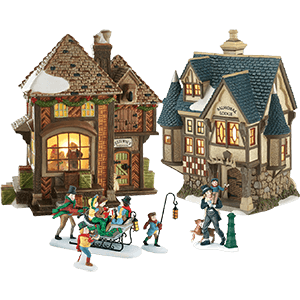 The New England village figurines offer industrious characters to fill your town, such as holiday carolers, a lamplighter, children building a snowman, and a street vendor, among others. We are pleased to offer an excellent selection of pieces to show off in your collectible colonial village. Enjoy Christmas at the North Pole alongside Santa and his elves with this fun Department 56 collection! 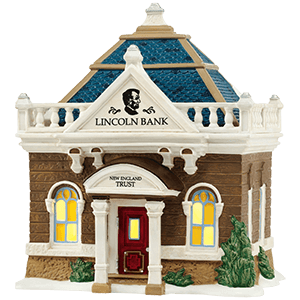 The North Pole village series lets you add some holiday cheer to your home decor. Inspired by the magic of the season, these North Pole buildings and village accessories will bring Christmas dreams to life for the young and young-at-heart with sweet treat, snowflake, and toy motifs. Start with Santas office as he and his elves check their lists, and swiftly move on to the various Christmas shops crafting everything from baby dolls to bikes to ugly sweaters. If you begin to feel peckish, the espresso bar, Easy-Bake bakery, cocoa cafe, and gumdrop factory are a few of the places to find a snack. 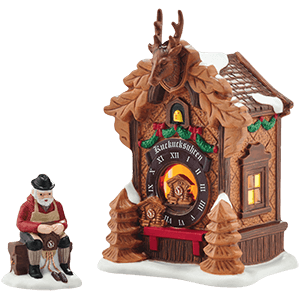 Populate your scene with Rudolph the Reindeer figurines as well as many different holiday elves who live at the North Pole in charming holiday cottages. 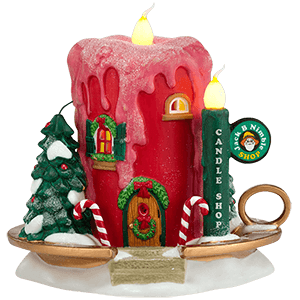 Many of the Christmas village buildings can be plugged into an electrical outlet to spread a cheery glow throughout your wintry scene, and several offer additional animation or audio features that make them truly amazing collectibles. Christmas spirit will infuse the air with these pieces on display! Make your miniature village the very best with our Department 56 village accessories! This category includes accessory buildings and figurines, like gazebos, town clocks, benches, ponds, woodland creatures, and extra villagers, as well as landscaping and greenery, walls, fences, streets, and more. Now you can add extra snow, trees of all kinds, moss, and more to your display. These holiday village accessories go along with our Department 56 Village collections, and a lot of them are versatile pieces that work for any type of miniature village. We also offer replacement bulbs, power cords, and AC DC adapters to help your village look its best and shine brightly in any room of your house. Give your seasonal village extra detail and a personal touch with these village accessories, and ensure its longevity with replacement parts specifically made for Department 56 buildings and figurines. Full of jolly good spirit, these charming Saint Nicholas figurines go wonderfully with any holiday decor. The Department 56 Possible Dreams collection captures the essence of Old Saint Nick in a variety of gorgeous Clothtique Santa figures. Clothtique stiffened fabric and mixed media details help each unique Santa Claus figurine come to life with intricate detail and excellent texture. 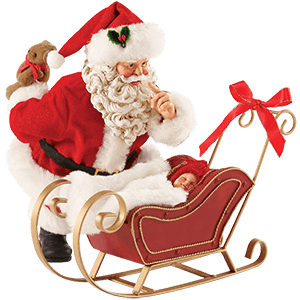 We are pleased to offer an excellent assortment of Christmas decor and Santa accessories, including Santas reindeer, sleigh, and toy sack. Many of these Santa statues display the big man in red with detailed props like picture frames, Christmas trees, pets, wreaths, his list, and other odds and ends. When preparing your home for Christmas, these gorgeous collectible figurines will get everyone in the holiday mood! Shop our selection of fun holiday globes here. Within their round glass orbs, scenes and characters appear among flurries of glitter, snow, or both, ready to delight come the holiday season. We carry a selection of fantasy and medieval themed snow globes and pop culture water globes, all with a festive holiday twist. 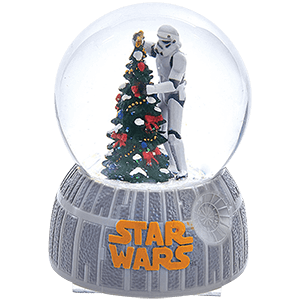 Shop our Star War Christmas globes, featuring characters like Jedi master Yoda and an imperial Stormtrooper dressed for the holidays or trimming the Christmas tree. Our holiday globes make great Christmas gifts and other celebrations, often becoming wonderful keepsakes of the season or cherished collectibles. With many of our water globes made out of high quality materials, they make for charming decorations among the rest of your holiday home decor. Let your favorite pop culture characters hang out in your home this holiday season with our holiday stockings. We also offer stocking holders and stocking hangers ideal for suspending your festive sock from a mantle or shelf. Shop Santa Yoda stockings as well as sturdy and stylish Darth Vader and Iron Throne stocking hangers. 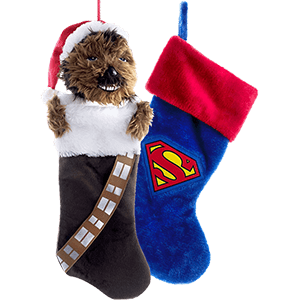 Holiday decorations like our Star Wars Chewbacca Plush Stocking make for great gifts or fun decorations sure to be treasured by fans of all ages for holiday season after season. Stockings are often a personal part of family holiday celebrations, so be sure to find the perfect holiday stocking for your loved ones here. For a haunted house or a spooky costume party, the frightful decorations found here contribute greatly to a bone-chilling atmosphere. In this section, you can expect jack-o-lanterns, evil clowns, possessed toys, and severed limbs sized appropriately for your Halloween tree. You may run across a zombie rising from its grave, or a witch concocting a boiling, magical brew. Perhaps you wish to cast a shadow over holiday cheer. Our killer elves and Krampus ornaments serve a reminder to all to avoid the naughty list. Feel free to scroll through this section, but do remember that it is not for the faint of heart. We are always uncovering, or rather, digging up things for the appreciation of true horror fans. Frightfully fun, the haunting figures of the Halloween Village Collection by Department 56 will send shivers of excitement down your spine! Let your nightmare town take on a life of its own with the spooky buildings and characters that we carry here. The Halloween village building options include a ramshackle train depot, a freaky carnival show, several witch cottages, a dreadful diner, and Harley Davidson hang-outs, among others. Many of these pieces can be plugged into an electrical outlet to spread an eerie glow throughout your supernatural scene, and some offer additional animation or audio features that make them truly hair-raising collectibles. Choose from a variety of colorful and creepy Halloween figurines to populate your boneyard, such as a werewolf biker, a ghastly clown, wicked witches, and hungry zombies. These hand-painted porcelain figures will make a chilling addition to any miniature Halloween town! With our Halloween decorations in your home or haunted house, you will definitely have the spookiest style around! We carry a range of Halloween home decor and home accents for adding an eerie vibe to any setting. 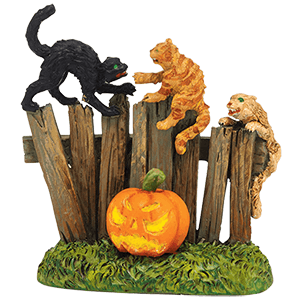 Here you will find all our Halloween home props for decorating, including jack-o-lantern misters, decorative skeletons, wall signs, and more featuring creatures and graphics from classic Halloween horror. We offer home decor depicting grinning skulls, scary monsters, witches both pretty and frightening, and much, much more. 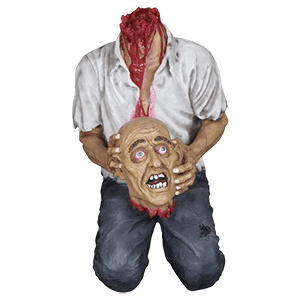 Halloween decor also includes animated props and home accents great for terrifying trick-or-treaters or members of your own family, like our spinning skull heads, animatronic corpses, mist makers, and poseable skeleton bodies. The boneyard accessories in the Halloween Village collection by Department 56 offer scarily adorable pieces to accent your nightmare town. The village landscape accessories include eerie icons like tombstones, jack-o-lanterns, skeletons, scarecrows, ravens, and toads in their frightful designs. Choose from wrought iron fencing, flickering street lamps, skeletal trees and shrubbery, and creepy park benches as you fill your Halloween setting. Animated Halloween figures provide another fun touch to your freaky scene with flying vultures, witches, and bats, and Halloween lighting helps to complete any village display. These hand-painted porcelain figurines possess spook-tacular detail and lurid hues to suit any haunted mansion!